Welcome to the information page for the listening bench installed in Coggeshall, Essex. The bench features clips about some of the main aspects of the village’s rich history, including tambour lace-making and former pubs. You can also hear about the history of the phrase ‘Coggeshall Job’. The bench is sited on Doubleday Corner outside Day Lewis pharmacy, at the crossroads of East Street and Market Hill. The bench has been put together by a group of volunteers who have an interest in the village’s history, with support from the Coggeshall Parish Council, Coggeshall Museum. 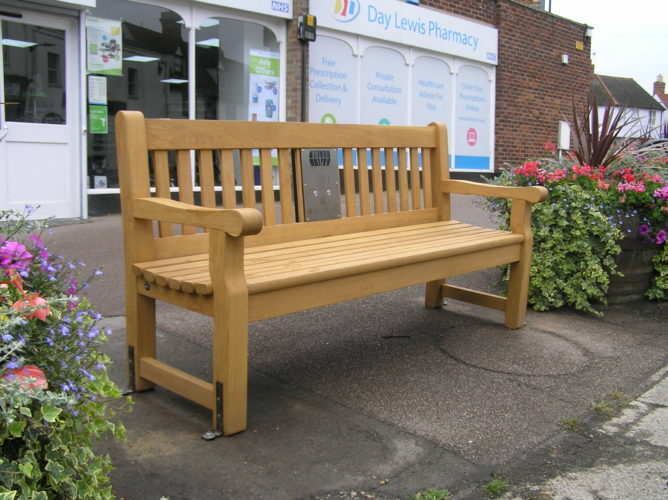 Steve Howlett installed the bench, and the East of England Co-operative Society kindly permitted the bench to be installed on their land. Michael Horne describes the history of the buildings surrounding the listening bench. David Vickery describes how the pilots based at Marks Hall airfield during the Second World War spent their time off in Coggeshall. From a BBC Essex recording made in 1990 (SA 1/631/1). Parts of a BBC Essex ‘Pub of the Week’ feature about the former Fleece pub in Coggeshall, recorded in 1994 (SA 1/1253/1). First part of an explanation of the term ‘Coggeshall Job’, produced by the Essex Education Resources Centre in 1970 (SA 6/289/1). Sue Game describes tambour lace-making, for which Coggeshall was once famous. Recorded in 2017 for the listening bench. Final part of the explanation of the term ‘Coggeshall Job’ (SA 6/289/1).